The Mobile Experiences for Tourism Project was funded by a New York Council on the Arts, Regional Economic Development grant, with a matching contributions from Rochester Institute of Technology and VisitRochester. Our design strategy and technologies directly address real tourism-centered problems from the perspective of the visitor. Developed within the MS Human Computer Interaction Program, Brian O’Keefe Ph.D., a Visiting Assistant Professor in RIT’s B. Thomas Golisano College of Computing and Information Sciences, founded this user experiences design research initiative. Our research brings together graduate students from across RIT, to research and develop pervasive mobile technologies that create new visitor experiences before, during and after visits. The Global Village Explorations project present a novel means of experiencing an unfamiliar tourist destination using location-based interaction design with mobile devices. Tracking a visitor’s location allows us to automatically present the visitor with relevant information as soon as they arrive at a point-of-interest. By synchronizing the delivery of digital content with the visitor’s physical location, the visitor is able to move through and explore the physical and digital spaces simultaneously, using a location-based interface to experience a blended space. We theorize that this location-based content delivery method will instill a sense of freedom and immersion as the visitor explores the blended space in a natural and serendipitous way. To test our theory and validate our design strategy, we have developed a prototype application called Global Village Explorations. Mobile Experiences for Tourism class of 2012 is concerned with the use of digital technologies to enhance the tourist experience before, during and after visits. 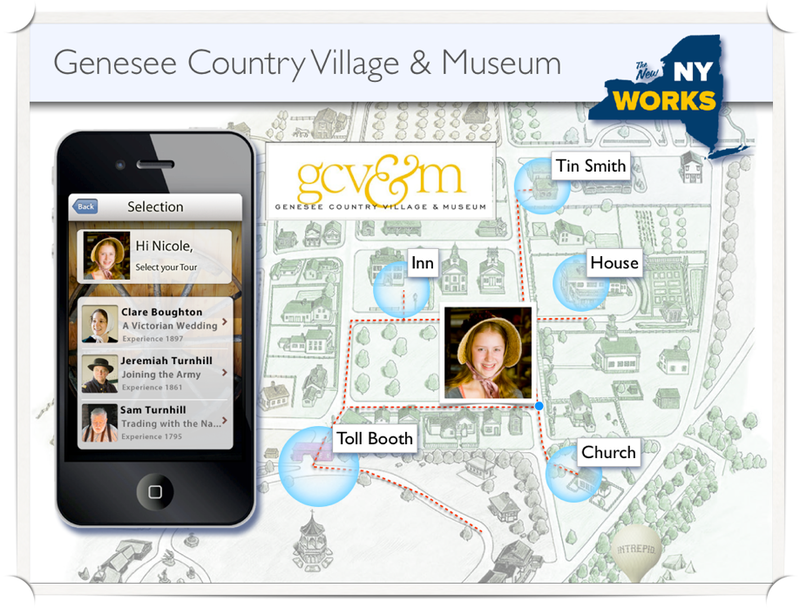 Our goal is to work with Visit Rochester, Genesee Country Village & Museum and Seneca Zoo to supplement education, automatically personalize visits, create personalized project and delight visitors and inspire sharing. Students from diverse RIT collages and programs e.g. Human Computer Interaction, Applied Experimental & Engineering Psychology, Information Sciences and Technology and Computer Science, came together to design and develop solutions for the visitor experience. Tourism is one of the largest global industries, both in terms of numbers of participants and aggregate expenditures. The primary goal of this course is to investigate how mobile computing can enhance the tourism experience by use of ethnographic study, historical research, and HCI methods. In doing so, we attempt to create novel augmentations, with special emphasis on experiencing a location’s history. A secondary goal is to investigate how computing can be used to create a tangible, personalized artifact that captures elements of the tourist’s experience.